Sometimes, I just need a recipe. Produce is piling up in the fridge, along with miscellaneous leftovers. Laundry is piling up over there, and there, and right here, and oh please don't tell me that's a pair of someone's socks under there. The laundry list (literally) is too dull to trot out, so suffice it to say that when we're woken each morning to the sound of our newly potty trained toddler cheerfully hollering "Mommy, Daddy, come get me, I need to do a pee pee! The sun is out!" I have the sense that I just turned out my bedside light moments ago. It's an incontrovertible truth about parenthood: we're a tired demographic. And tired looks like behind in your chores, social life, work life... Somehow, though I function more efficiently when I sleep a minimum of 7 hours in a night, and though I announced that March of 2011 would be the month when I was in bed by 10 pm every single one of those 31 nights, well, it's not working out. And instead, I'm cranky, clumsy, short-tempered, distractible, impatient, uncreative...tired, in short. I accept that I have to set boundaries—for myself and the people who ask things of me. But being truly energetic, having free time and the desire to use it creatively, exercising, enjoying my family...it's amazing how unattainable it all seems as soon as you get in the hole in terms of sleep. Times like these, I turn to recipes. My recipe for tantrums: let them happen, try not to join in. My recipe for holding a job: smile and keep moving, everyone has bad days. My recipe for staying married: apologize a lot, accept criticism. 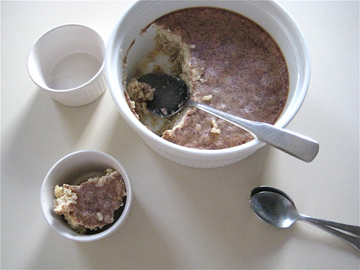 My recipe for leftover brown rice and a dead tired, chilly, please-take-care-of-me feeling: brown rice pudding. Actually, it's not my recipe. Usually when I cook I take inspiration from fresh, seasonal ingredients, and I enjoy coming up with something original. But right now, I just want a recipe. This week, I kept the King Arthur Flour Whole Grain Baking open on the counter. 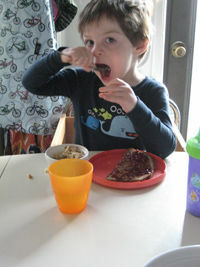 We made whole wheat blueberry muffins, as well as brown rice pudding. It's a reassuringly authoritative yet homey book, and the recipes are both wholesome (grains) and comforting (sugar, nutmeg, butter). It's a cookbook you can use even when you can't carry on a conversation or remember how it feels to read the paper. Because even when there's NO TIME for Anything Whatsoever, I still believe that there must be time to cook. All I need is a good recipe.